Question:What makes the alka seltzer bubble? Hypothesis:The alma seltzer has a chemical reaction. 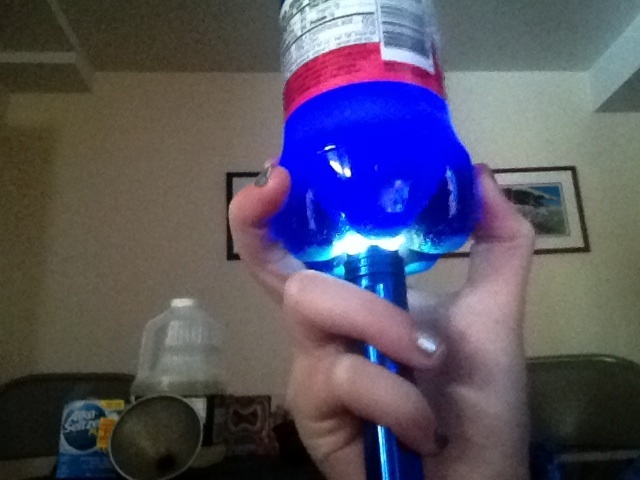 Do not drink the lava lamp! You need to have a medium size water bottle. Only use 2 caps of alka seltzer. Pour all the water in the bottle. Put the funnel in the bottle and pour all of your vegetable oil in. Put 10 drops of food coloring in the bottle. Conclusions: Our hypothesis was correct. The alka seltzer and the water make a chemical reaction when you combine them together. Inside alka seltzer are three things, Sodium Bicarbonate,Baking Soda and Citric acid. These chemicals aren't mixed yet because they're a solid on the inside of the alka seltzer,that's why they can't move and mix together.But once you drop the alka seltzer in the water it turns into a gas and they all mix together and creates a chemical reaction which makes them fizz and bubble. I am a funky girl who likes to laugh,have fun and do sports like skiing and swimming.My hobbies are painting and clay. I am a crazy girl that likes skiing and gymnastics. My hobbies are art and science .